Swings: UP-UP-UP (from DN-UP-DN). Weekly just toggled UP. Here again, those who played the bounce on 1250 last week must be smiling ear to ear (cf last post). MTFS is certainly overbought and ES ended the day on a yellow bar. Since Fib target was about hit, some profit taking remains possible but ES could certainly also reach higher to 1307 later on (Fib/MM targets). Continuation of a "wavy" upper trend is our favoured scenario. MTFS is positive yet does not indicate decisive energy for a seemingly unconvicing breakout and we could anticipate a longer congestion in the same triangle. Entropy could also peak soon. This does not change our 'long' outlook overall but we know we should expect a runaway recovery and a pullback is actually quite likely at some point this coming week. We finally got a yellow bar and a MTFS showing first signs of completion. The green and brown lines do however still point down so congestion is likely here. The bounce we've been expecting is certainly here though so a recovery is now slowly under way, and we can (almost) safely say that the support levels we've been watching for weeks (i.e. 1230-1250) will be holding. 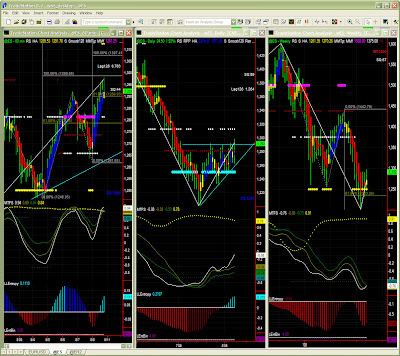 All in all, all 3 swings are up, and we'll check for the optimal entry using a shorter time frame, if not long already. Note: we're not out of the woods just yet, but stop level is easy to set as we are sitting on a strong 1250 support level. We'll try and cautiously move stop to ensure breakeven when possible. There is indeed no guarantee of a strong recovery in the short term.